Air and reaction gases that are trapped during closed infusion processes can cause weaknesses in lightweight components. In conventional infusion processes, the entire assembly – subjected to low pressure – must be extensively flushed with the infusion medium until it can be safely assumed that there is no more trapped air and gas inside the component. In the VAP®assembly, the flexible membrane system – which is permeable to gas but impermeable to the resin – is superficially contacted with the component. When the resin is infiltrated, it separates the matrix from the vacuum duct. With the aid of low-pressure, trapped air and gas can then escape through micro-permeability and are purged via the textile layer. The vacuum acts uniformly, so trapped air and gas can be evacuated across the entire contact surface during and after infiltration. Semi-permeable VAP® membrane systems from Trans-Textil are full of tiny pores. 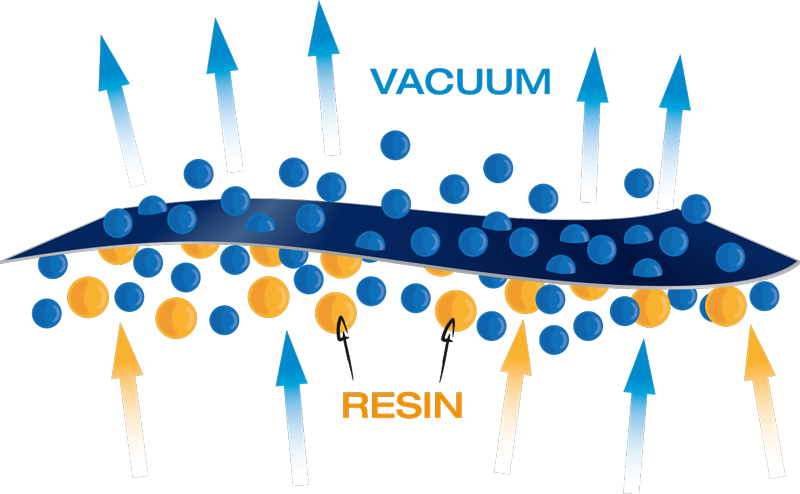 Under vacuum conditions, small molecules of trapped air and gas can be reliably removed, while the large-molecule resin stays stable in the mould. "A homogeneous fibre volume content and low porosity in the laminate are proven to result in better component characteristics than those produced in any other known injection process."